Over the fall term, first-year BBA students were vying to win the BU111 Live Case Competition, the first in a series of customized educational initiatives that provide first-hand business experience. This year’s first-year Lazaridis BBA students worked with Kik Interactive executives to help solve a real business problem. As part of the BU111 required course, the Canadian mobile instant messaging tech company presented a case for students to solve: identify bots that could be valuable to Kik’s users and partners. “The case was a very unique opportunity because it was all over the technology news in the spring and there are endless articles written about the fact that this innovation will offer great opportunities for businesses to engage customers in new ways,” said Associate Professor Sofy Carayannopoulos, who coordinates the Lazaridis School’s BU111 course. A total of 48 advanced to the semi-final round and six teams moved on to the finals on Nov. 19. 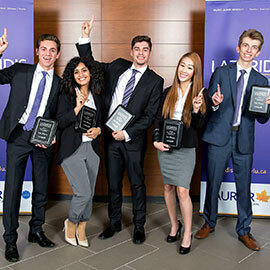 The first-place team, Lab B17, proposed a post-secondary information bot that would help students quickly and easily find university program information, a solution that would assist both universities and its students. Congratulations to Lab B17: of students Cory Katzman, Josh Kravitz, Kitty Liang, Monica Sedra and Noah Shechtman. Each member of the winning team received $750 and has the opportunity to interview for a summer position with Kik. BU111 Live Case Competition takes place during the first semester of first year. Over the course of the fall term, students work in groups to answer a strategic business question posed by a company and are then evaluated by a panel of industry experts. This lays the foundation for the second term of first-year during which students work in small teams to perfect the art of the pitch in the mandatory PepsiCo Pitch Competition in February. At the end of the term, first-year students build further upon their skills in solving business problems and pitching in the BDO New Venture Competition. In this competition, students develop a business plan and present it to their peers with finalists presenting to a panel of external entrepreneurs and business community members.